Jean-François Millet (1814 to1875) was born in Normandy and was one of the Barbizon school painters. 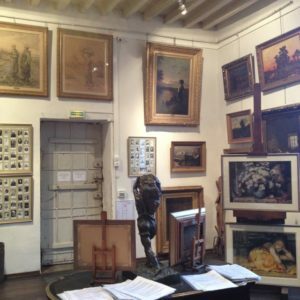 Today, in Barbizon, you can visit his original studio just outside Paris that is crammed with his drawings, some paintings and many personal artefacts. Millet moved to Paris in 1837 where he was funded to study at the Ecole des Beaux-Arts with Paul Delaroche. In 1839 his scholarship was terminated, plus his first submission to the Paris Salon was rejected. This was a difficult period for him. Fighting against great odds, and suffering a long period of extreme hardship, Millet nevertheless married in 1841. However, after further rejections from the Paris Salon in 1843, his first wife died of consumption the same year. He went briefly to Le Havre with his new companion Catherine Lemaire. They would have nine children and remain together for the rest of Millet’s life, he would eventually marry her in a civil ceremony in 1853. 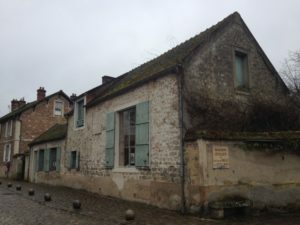 The modest museum is in the house where the family lived in Barbizon. It was originally a barn. Things did gradually turn around for him. In 1847 his first Salon success came with the exhibition of Oedipus Taken down from the Tree, and in 1848 his Winnower was bought by the government. It was praised by the critic Gautier as having ‘everything it takes to horrify the bourgeois’. The Oedipus painting is one of Millet’s rare mythological subjects. 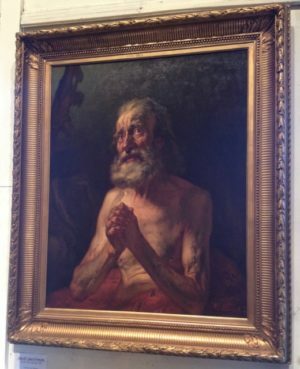 Scientific exploration has shown that beneath the surface is a painting of Saint Jerome, which had been previously rejected by the Paris Salon and thought lost. In 1849 Millet painted Harvesters, a commission for the state. In the Salon of that year he exhibited Shepherdess Sitting at the Edge of the Forest, a small oil painting which turned away from previous idealised pastoral subjects in favour of a more realistic and personal approach. While they were living back in Paris, a cholera epidemic broke out after the Revolution. Accordingly, in 1949 he moved his family to Barbizon near the Fontainebleau Forest, south east of Paris. He lived here for the rest of his life, mostly in poverty. He resisted the then tradition of classical and religious painting, preferring a direct representation of the natural world. 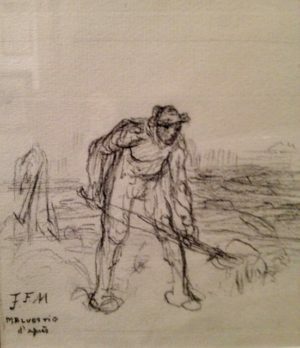 In doing so, Millet was the first painter to show rural life in a way that the peasant was the central heroic figure. It is these realistic scenes of farmers absorbed in their work on the land that are now seen as part of the Realist art movement. They capture the poverty of rural French life with their monumental sense of scale and the gentle dignity of the figures. Conservatives at the time regarded his paintings as unrefined and subversive, as they saw the peasantry being a potential source of civil unrest. The first room was the studio with a north light window. Although he drew from life, he always painted in his studio from his drawings. 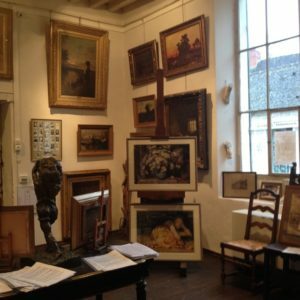 In Barbizon, you can visit this Maison et Atelier where he lived and worked for 25 years, and where the majority of his most famous works were painted. 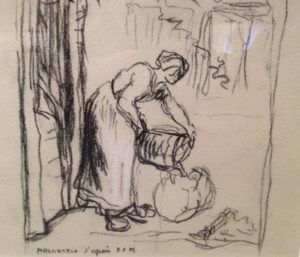 You can see many of his preparatory drawings, wonderfully eloquent and strong. 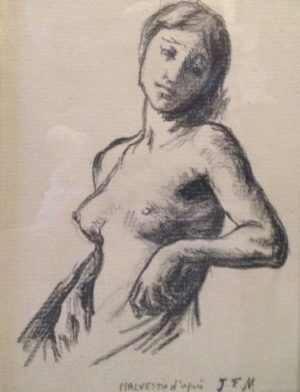 Amazingly, even some of his original drawings are for sale, along with works of fellow Barbizon School painters, and some oil paintings from that time. 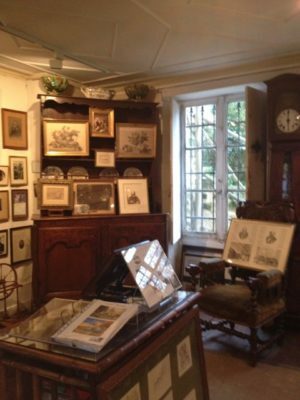 The museum is in the three modest rooms that he, his wife, and their nine children lived. It is not a refined, overly presented or sanitised space – and this feels perfectly right considering the subject matter of his paintings. Originally it was a barn, with the first room being his atelier with its large north facing window. It is rare these days to be able to visit the studio of a true past master that still feels it has his spirit. 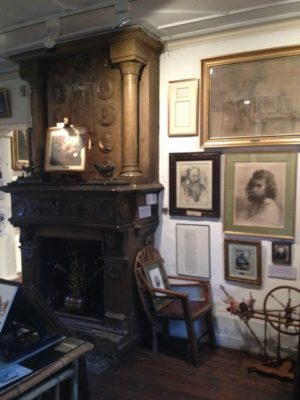 It is a small space crammed with his drawings, etching and engravings, some paintings, plaster casts and sculptures, furniture and artefacts, some of his pallets with his dried paint, and even the same type of clogs that his pheasants wear in the paintings. I think it is wonderful, and it felt to me that he had just left. Romantic that I am, I thought I imagined the faint whiff of his pipe tobacco mixing with the cloying scent of linseed oil and the wood smoke from the fire. He painted for the rest of his life in this studio. However, from about 1850 his fortunes changed for the better. 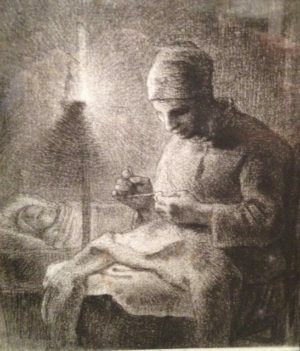 Millet entered into an arrangement with his friend Sensier, who provided the artist with materials and money in return for drawings and paintings, while Millet was also free to sell work to other buyers. At the 1850 Salon in Paris, he exhibited The Haymakers Rest and The Sower, which was particularly controversial in the political climate of the time, but was to be seen as his first major masterpiece and the earliest of the trio of paintings that would include his most famous The Gleaners and The Angelus (Les glaneuses and L’Angélus). From 1850 to 1853 Millet worked on Harvesters Resting (Ruth and Boaz) in Barbizon at this atelier. This painting he would eventually consider as his most important. Conceived to rival his heroes Michelangelo and Poussin, it was the painting that marked his complete transition from the depiction of symbolic imagery of peasant life to that of contemporary social conditions. It was the only painting he ever dated. In the 1860s, the world caught up with him and he began to prosper and to build a reputation which meant that his last years were marked by some financial success and increased official recognition. In 1867, the Exposition Universelle hosted a major showing of his work. The following year Millet was named Chevalier de la Légion d’Honneur and in 1870 he was elected to the Paris Salon jury. The stopped clock in the studio. Millet was not the first painter to go to Barbizon. 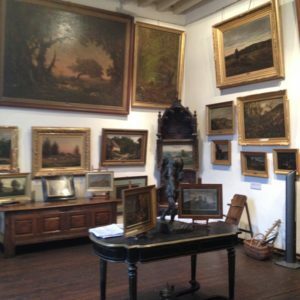 Beginning as early as the 1820s, artists had gone to Barbizon village to paint in the nearby forest. 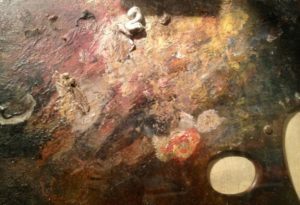 In fact, in the late 1860s, these painters attracted the attention of a younger generation of French artists including Monet, Renoir and Sisley. In the 1870s these younger artists, with others, developed Impressionism. 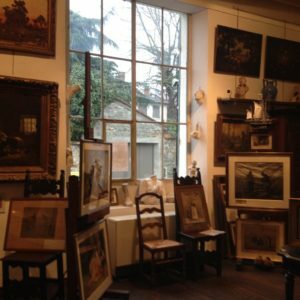 It was only in the 19th century after the rise of Impressionism that this informal group of artists, Corot, Rousseau, Courbet, Millet and others, began to be known as members of a school: the Barbizon School of Painters. They painted nature as they saw it, anticipating the ethos of Impressionism. Millets subject matter with its social implications appealed greatly to artists such as Seurat and van Gogh, but he was only internationally recognised as an important and highly influential artist after he died. By the time of his death although he was an honoured figure he was still not financially secure, so much so that fellow Babrizon school painter and close friend Corot supported his widow. He died in Barbizon in 1875 where he is buried next to his closest friend and fellow Barbizon School Painter, Théodore Rousseau. 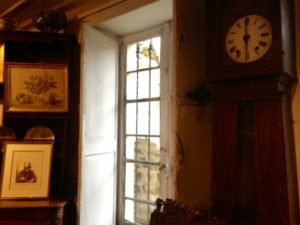 The clock in his studio was stopped at the time when he died, and it is still stopped at 6 o’clock. Many of his paintings can be seen at the Musée d’Orsay in Paris, including L’Angélus and Les glaneuses. Museum of Fine Art, Boston, has a collection of his drawings, pastels, prints, and paintings. 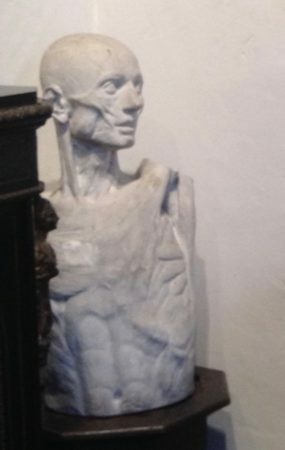 Please add me to your mailing list on classically inspired figurative art. Copyright © 2019 Della Drees. Powered by WordPress. Theme: Accelerate by ThemeGrill.